Peppermint is such a familiar, comforting scent—is it not? It makes us feel at home and at ease, and there’s so much more to peppermint than a pleasant aroma and tasty flavor. As one of the oldest and most continuously used therapeutic oils, this happy fragrance is effective at treating a wide range of conditions, and its cooling properties make it particularly well suited to the summer heat. Grab a bottle of peppermint essential oil from your local health food store and give the following tips a chance. I bet before long peppermint oil will hold a permanent place in your handbag. I don’t leave home without mine! Relieve headaches. My number one use for peppermint essential oil is as a replacement for standard pain relievers like ibuprofen when I have a headahce. 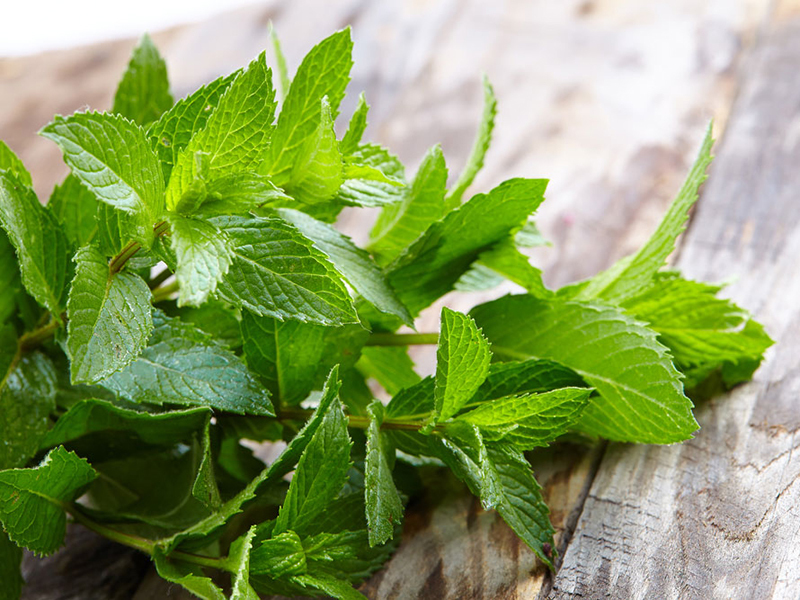 Peppermint oil is naturally analgesic, meaning it’s an effective painkiller or numbing agent. When I feel a headache coming on, I dab peppermint oil on my temples or at the base of my skull—wherever the pain is concentrated. Within minutes I feel relief. Careful—peppermint oil is strong so use a tiny bit until you get to know its effect. Test some on your skin before going all out. Energize and enhance mental clarity. Peppermint has a clearing nature that makes it a powerful tool for enhancing focus and restoring balance to the mind. Sharpen your concentration, stimulate your mind and relieve distraction and worry by incorporating peppermint oil into your routine. Try diffusing peppermint oil as an aromatherapy treatment or sipping peppermint tea during times when you really need to focus and perform at your best. Zoe Organics Refresh Oil and Blissoma Stress Relief Serum are brilliant aromatherapy treatments that highlight peppermint’s power. Cool down on hot days. Peppermint oil has an incredible ability to cool you down, both mentally and physically—but it’s the physical cooling effect that really helps with these extra hot days. Reach for soap or body oils that contain peppermint oil. They’ll give skin a slight tingle and make you feel like a cool breeze is rolling across your skin. To give you an idea of just how effective this is, I have to stay away from body oils with peppermint oil during the winter because it makes me feel so cold I actually shiver. I love the Bottega Organica Dual Action Peppermint Body Mist for its moisturizing and cooling effect. Meow Meow Tweet Grapefruit Mint Soap Bar is an excellent choice for a milder dose of peppermint. What’s your favorite way to experience peppermint oil?